It is not necessary to use cleaning agents on your carpet every week. Frequent vacuuming helps to reduce dust mites which can trigger asthma and allergic reactions. 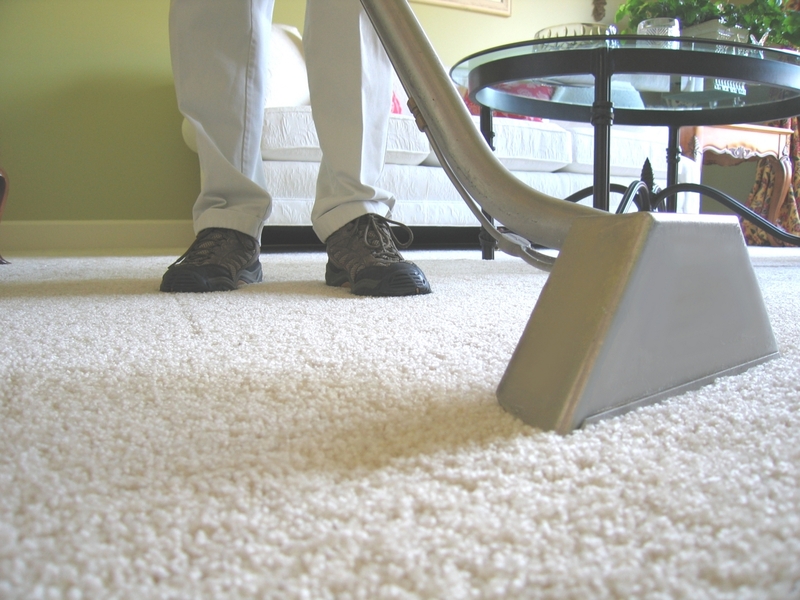 You should run a vacuum over your carpet once or twice a week to prevent dirt from settling deep into the fibers. A good vacuum cleaner with strong suction, rotating brushes and a filter is recommended to remove all the dirt from your carpets. Vacuum occasionally along walls and carpet edges to avoid dirt accumulation in those areas. Food spill or pet urine on a carpet must be treated promptly before it dries. Blot up as much liquid as possible with paper towels or a clean cloth. Soak up liquid spills by covering them with clean white towels. Scrape sticky substances off carpets with a spatula. To clean the stain, mix 1/2 teaspoon mild liquid soap in warm water and apply a small amount, blot by pressing a clean white towel into the carpet and lift. Don’t scrub, that will damage carpet fibers and make the stain spread. After stain is removed, rinse the area with a solution of a few teaspoons of white vinegar to one cup water and blot with another clean towel. For that pet urine smell that just will not go away, try our new Enzyme D to elimate odours for good. Now a day’s various kinds of cleaning machines are available in markets that could work best for your carpet like steam cleaning machines, carpet shampooers, dry cleaning machines, bonnet carpet cleaning machines and spotter carpet cleaning machines. You can also hire expert carpet cleaners if you are too busy to regularly maintain your carpet or if your carpet is too expensive or valuable to trust to unprofessional cleaning techniques. It is not too difficult to learn how to clean carpets. You just have to know which tools and methods best suit your situation. If you can’t handle it yourself, you can talk to the experts. Give us a call, we would be glad to help with any questions you have. Marble is one of the most beautiful, unique and metamorphic rocks around. Marble is a limestone that is formed after the process of recrystallization through heat or pressure. It enhances the look of our kitchens, bathrooms, counters and is used in decorative arts like furniture, fireplaces, clocks, light fittings and lampshades and is even used on floors. It has a dense crystalline structure and it has great strength and durability. It varies in colors because in the process of crystallization original limestone mixed with natural elements result in different colored marble. Marble is known to be hard wearing yet brittle like all stones. However, one of the most common misconceptions about marble is that it is unbreakable, but poor handling and exposure to harsh chemicals can damage the stone. Never use lemon juice, vinegar, wine and other acidic ingredients on marble, it can scratch the surface and remove the polish. Marble is porous therefore can be easily stained. It needs special care when cleaning, especially with light colored marble as the stains are more visible. It should be cleaned weekly and stains should be removed instantly otherwise over time it will lose its shine and charm. Wipe marble countertops regularly with plenty of lukewarm water and a few drops of mild liquid dishwashing detergent or baking soda. Let it dry for about a minute before rinsing with fresh water. Dry the marble countertop with a soft, dry cloth. If you have streaks and a dull finish, it may be because there is still soap residue on the surface. Rinse the sponge or cloth again with hot water and wring it out thoroughly to remove most of the excess water. Wipe over the surface again to remove any residue. Keep hot items off of marble, always use a folded towel or potholder for protection. Use coasters to prevent spillage onto your marble as acids in fruit juice and carbonated beverages can etch a shiny surface. Apply a marble polish occasionally to the surface to restore shine and brightness. Cleaning up the kitchen is part of cooking. Not only is it easier to cook and bake in a clean kitchen, but clean surfaces will keep your family healthier and safer. Take some time to learn these easy tips and preventative measures and before you know it your kitchen will be cleaned and sanitized. Make cleaning second nature and you’ll save time and money. 1) Clean counters and sinks, and mop the floor at least once a week. Use a mop with antibacterial soap to kill bacteria. Check out our floor care section to find the right product for you. 2) To remove grease, clean appliances thoroughly with a sponge, do not use steel wool as this will scratch the surface. Vinegar is a good cleaner, apply it on the surface and scrub. 3) Remove fingerprints from cabinets with a soft sponge using dish soap and water. Empty out kitchen cabinets and wipe morsels from inside the cabinets with a damp cloth. Line shelves with paper towels that can be changed easily when required. 4) Keep kitchen windows clean inside and out. 5) Wash kitchen curtains weekly and press before hanging. 6) Empty the trashcan and reline it. If your trashcan is very dirty, wash it with detergent. To keep the garbage from sticking on the base of the bin place newspaper down before lining. 7) Do not use the same duster or cloths to clean everything. Change kitchen cloths everyday or even twice in the same day for drying dishes, wiping spills and cleaning countertops. 8 ) Organize cutlery, crockery and pantry areas. Discard all the items that are past their use-by date, make a list of items that need to be replaced and give away anything that won’t be used. 9) Wipe down bacteria friendly spots on the refrigerator handle with Sprayway Disinfectant Spray . 10) Cover the tops of kitchen cabinets with wax paper; it will attract the grease and dirt. After every week just roll up the paper, discard and replace. 11) Use Pest Control Products, Insecticides and Pesticides for ants and roaches. 12) Wash rarely used utensils. Replace or repair items that are not in use, broken or not in working condition. 13) Wipe clean the exhaust fan and light fittings. Dust the walls and ceiling.